Luxe Bakery explains how Ordermentum has enabled them to scale their business and reduce costs. Watch the video below. Luxe Bakery actually started as Luxe Cafe. With a passion for great food and coffee, the Luxe team weren't entirely happy with the bread supply, so began to make it themselves. Four years on and the bakery is now supplying over 400 cafes and restaurants, and is one of the most recognisable brands of baked goods in Sydney. When Luxe first began, they were supplying their own cafes, and about 6 wholesale customers. Fast forward 12 months and the bakery had grown to 50 customers and needed a new space. Before Ordermentum, Luxe was constantly dealing with having to give credits for incorrect orders, their sales reps were sitting in the office chasing orders at cut off times and long weekends were a nightmare. Easter weekend meant chasing 4 days worth of orders and racing to process them and 3-4 staff having to hit the phones and call everyone. Now, everything has a 3pm cutoff and the orders roll in on their own. Customer service has gone from 5-6 people (including sales reps who should have been on the road) down to 1, who now spends most of her time on marketing and activities that are helping the business grow, rather than chasing late orders and late invoices. "We've gone from 100 active customers now to 400 active customers. 100 invoices per day was a big day for us 3 years ago, and now we're doing close to 250 per day" says General Manager Justin Chapman. The business has been able to dramatically reduce packing errors, credits have been halved, errors have gone down and wastage has dropped drastically. All of those combined has lead to a huge drop in costs. 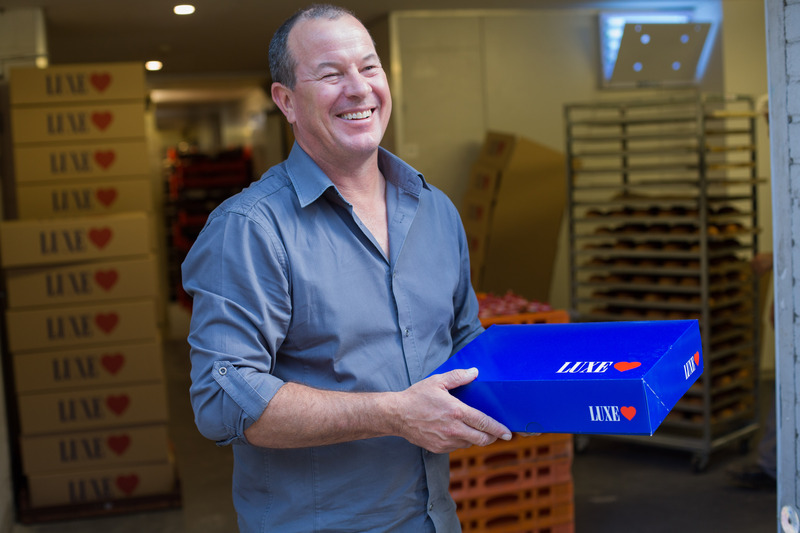 But it hasn't just been about fixing problems, by shifting from the business focussing on eliminating errors, Luxe bakery has been able to instead focus on growth. As well as staff resources being able to be reallocated to marketing, Luxe now has an instant sales channel for new products. Luxe is constantly innovating, changing products every 3 months and experimenting with seasonal trends. Previously, a new product launch meant going out to the top 20 customers and offering them samples, which might result in 10 orders in the first week. Now, as soon as products go on Ordermentum, they'll see 20 orders in the first day. "As we add new products to our range, we simply put it onto Ordermentum and from that day we're getting orders straight away" said Justin. "Whereas in the past, Customers that had been with us for 3 years prior didn't even know we had new products, unless we went out and showed them." Justin doesn't just credit Ordermentum for helping internal processes, but his customers also give rave reviews. "New customers, they love it. It's very easy for them. They get a confirmation of their orders being placed. They see what day its going to be delivered. If they have an event coming up 3 days in advance they can put through an order 3 days earlier and know that's its going to be accurately processed." By putting the ordering into their customers hands, Luxe has found there isn't just a reduction in interanal erros, but also "external errors." When customers can see exactly what they are ordering, there's no confusion when someone rings up and asks for "6 breads" and there are certainly no disputes over who got it wrong, when customers get to see a confirmation of their order before the place it, and a clear trail of invoices. All in all, Justin credits Ordermentum with a huge impact on his business. "We've been able to scale with Ordermentum. The business has grown threefold from where we were. If you want grow, and you want to reduce your costs, it's the perfect tool to use." To see how Ordermentum seamlessly connects accounting, production, and ordering for better business performance fill in the form below. Be the supplier your customers love.